The Cherry Hill Education Foundation supports the Cherry Hill Public Schools and the more than 11,300 students, 8,000 families, and about 1,600 staff. Since late 2007, the Cherry Hill Education Foundation has provided more than $1,200,000 in grant funding and donations to support educational programming throughout the Cherry Hill School District. Peace Mural at Thomas Paine Elementary School; funded, in part, by a grant from the Cherry Hill Education Foundation. Click HERE for a list of grants funded, by school, since 2007. Although we were very pleased with the quality and spirit of the 2018 Dancing with the Cherry Hill Stars, we regret to announce that the fundraising efforts for this year did not meet our expectations. Based on record-low ticket sales, half the number of ads in the ad book, and fewer donations, the profits that we previously enjoyed from the previous ten years of the event did not take place this year. Therefore, based on our limited funds, the Cherry Hill Education Foundation will be taking a one-year hiatus with our grant program for the 2018-19 school year. 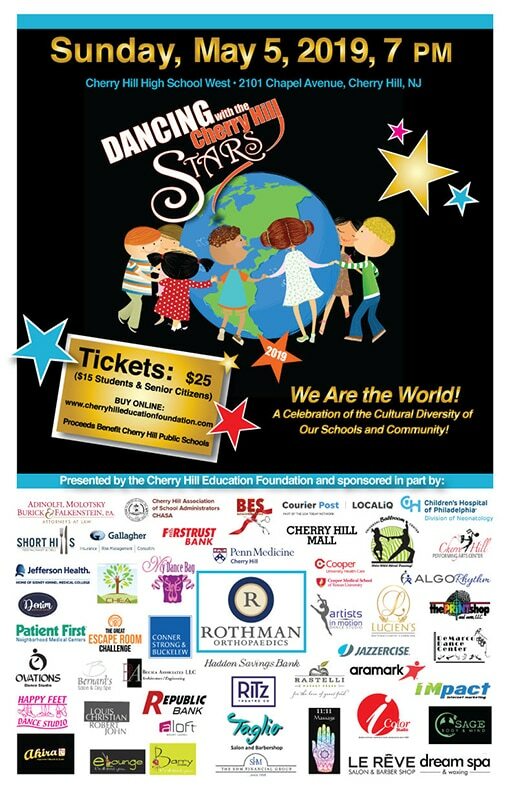 Our expectations for the 2019 Dancing with the Cherry Hill Stars will include our sincere request that principals, teachers, and the community support our event with the purchase of tickets, ads, and/or donations to the event. It is our hope that the fundraising efforts from the 2019 show will once again be successful and enable us to reinstate our grant program for the 2019-20 school year.